Here are two things Americans love: inventiveness and upward mobility.The idea that becoming an inventor can offer a way to climb the income ladder is therefore an intoxicating one. More entrepreneurialism and more equality: who could be against that? There are however some challenges here. First, entrepreneurs are, by definition, risk takers. When their risks pay off, they become rich and likely famous. But when they do not, they face financial ruin, unless they have a financial cushion. Source: Bell, Raj Chetty, Xavier Jaravel, Neviana Petkova and John Van Reenen. 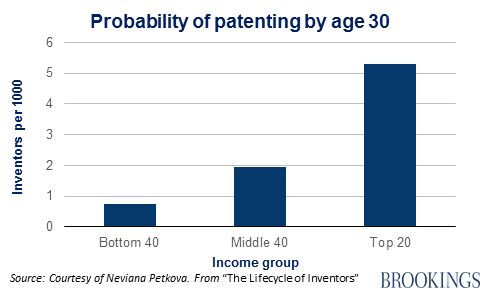 “Who Becomes an Inventor in America? The Importance of Exposure to Innovation”. Available at http://www.equality-of-opportunity.org/assets/documents/inventors_paper.pdf. There are obviously many factors at work here, including simply being aware of the process of applying for a patent. 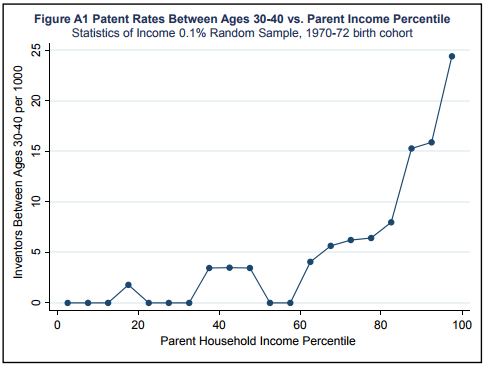 But if inventors are drawn largely from richer families, to the extent that their inventions are successful, intergenerational mobility will worsen rather than improve. This is one area where market regulations may be worsening inequality, according to Brink Lindsey and Steven Teles in their new book, The Captured Economy: How the Powerful Enrich Themselves, Slow Down Growth and Increase Inequality. They argue that “over-juiced” intellectual property protections, which have expanded copyright and patent rights, are now barriers to both innovation and upward mobility. Politicians will no doubt continue to tout the potential of entrepreneurship and inventiveness as a path to the American Dream. But the growth of ‘weaponized defensive patenting’ identified by Lindsey and Teles suggests that if anything, they have become another means by which that dream is hoarded.